Quick Scan: A user can use this mode if the BKF file is slightly damaged or in a healthy state. 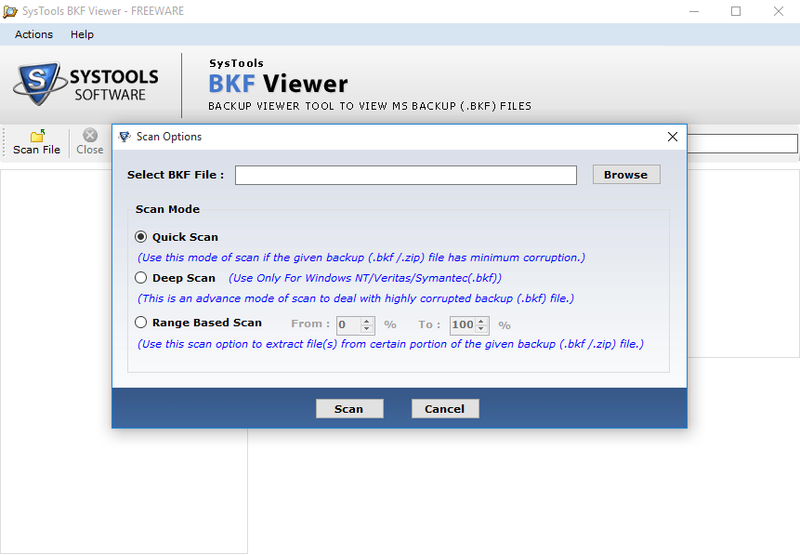 Advance Scan: BKF Backup File Reader provides this scanning mode which is for highly corrupted Windows backup BKF file. Range-based Scan: This mode is to extract data from a certain portion or range of the backup file. 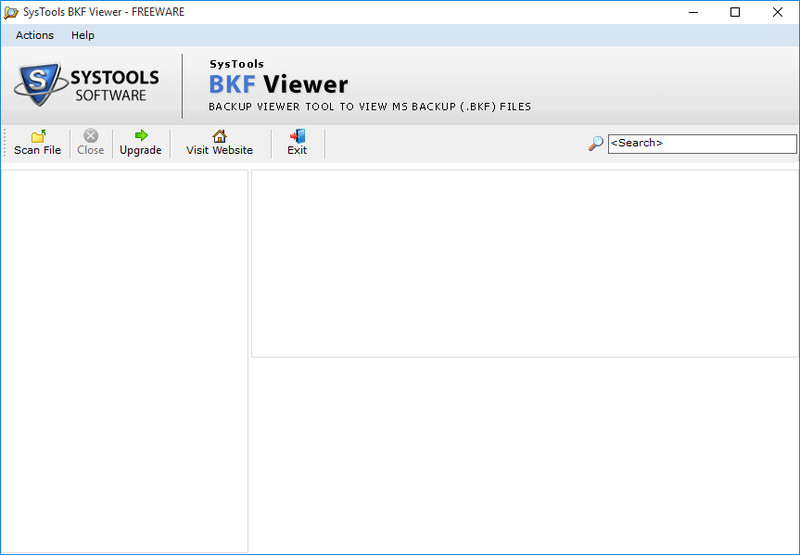 BKF Viewer Tool is compatible with Windows 7/8/8.1, 2008/2012 (32-bit & 64-bit), Windows 10 (32-bit & 64-bit) versions. You can easily open BKF file in Windows 10, 8, 7 OS using the freeware BKF Viewer tool to read whatever inside it such as images, excel sheets or any other important data. You will be able to view everything including all the Meta information. BKF Reader software has 3 scanning modes i.e. Quick, Advance and Range-based which enables a user to view even the highly corrupt and inaccessible data file instantly. You can also extract data from a certain section of the backup file. The Search feature allows a user to make the query-based search option to find the targeted file. The file can be anything like a picture, document etc. The BKF File Reader searches and shows the data item from the backup file of any size. The BKF Viewer can be installed on all Windows Operating System such as XP, Windows 7, 8 and 10. If you have taken the backup in XP (in .bkf format) and upgraded to Windows 7, then also you can view them with the help of the tool. The BKF Reader for Windows comes with the pre-bundled host of features to help a user to view all the files inside the BKF backup file instantly. So, if you are a new Windows 7 or 8 user, who just migrated from Windows XP and needs to view data from the Windows backup BKF or Zip file, then this tool will help a lot in viewing all the data items. Preview everything inside with their attributes (Meta information such as date and last modified). Search and find instantly without having to go through each and every file. A Simple User interface for easy accessibility and readability. This file format is created when you take backup in Windows OS system. This format is supported by Windows NT 2000, XP and Windows Server 2003. 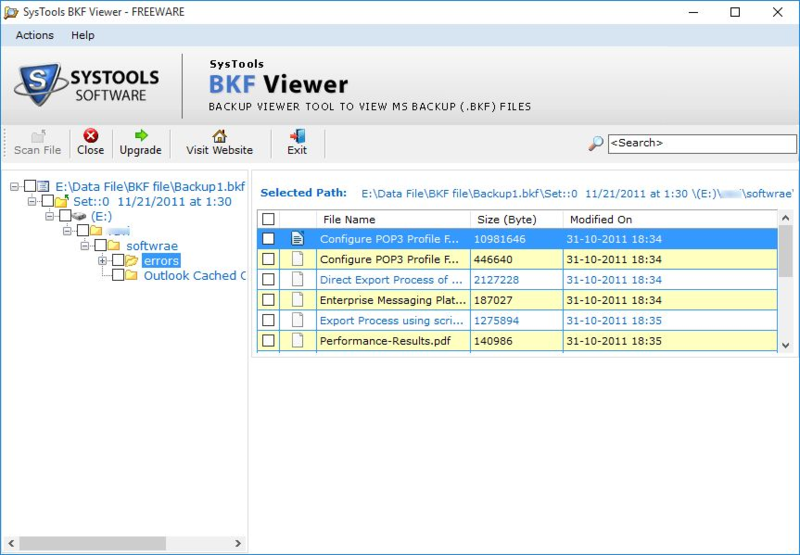 Demo version of BKF File Viewer Tool only shows the preview of Windows Backup BKF & ZIP Files. Explain the working of BKF File Viewer Tool? Step 1: Install & run BKF Viewer application. Step 2: Click on Scan File button You need to browse & select Windows backup BKF or Zip file. Step 3: Choose the scanning mode and then, click on Scan button. Step 4: After the successful scanning of the backup file, one can view and search all the data items from the file. I took the backup in XP but now, I am currently using Windows 7 OS. Can Windows Backup BKF Reader opens and shows all the data items on the current platform? This is totally fine with the software as there is no external dependency. You can simply view everything inside the BKF file regardless of the operating system that you are using. On which OS the software is compatible with? The software is primarily designed for Windows operating system. So, if you have any Windows version (10, 8.1, 8, 7, XP, etc) running in your system, the software will work on it easily and smoothly. "The BKF Reader application is very simple to use and does its job very fast. The best part is that the application is free of cost for viewing data contents within the BKF file. I really liked the user interface which is very simple to use. Kudos to the developer of the Windows Backup BKF File Reader application!" "I recently migrated to Windows 8 and I was not sure how to view all the files within the BKF file in Win 8 environment but after searching on the web, I finally got a solution i.e FreeViewer BKF Viewer software. It is a great Tool and recommended to all the users those are facing similar issues." "I used BKF File Opener tool to view all the data items from the Windows backup file. It was easy to search every single item from the file with the help of Advance search option. The tool provides flexibility to open BKF file of any size as there is no limit on the file size. " "I must say that the tool works great on Windows 10 OS. 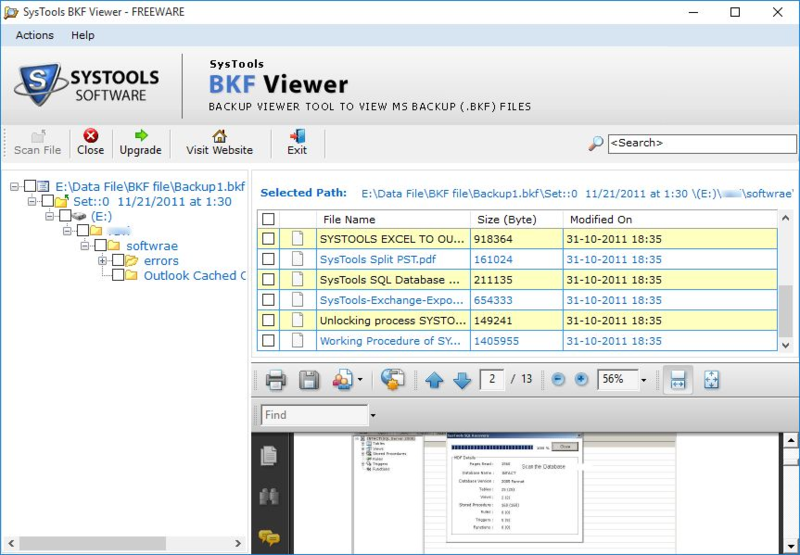 It is easy to open an old backup file of any Windows version with the help of BKF Viewer Tool. This application was suggested by my friend and I want to recommend this utility to simplify all the problems faced by others."